3 Best Ice Cream & Gelato Shops to Try in Tokyo! | Goin’ Japanesque! I really hate summer in Japan; particularly in Tokyo. Tokyo is so muggy in the summer, and the heat is too strong to be true. Staying indoor for a long time will cause you to get sick, as most buildings set the air conditioners to very low temperature. Getting a cup of ice cream or gelato is a smarter way to beat the heat, perfect to chill you on a sweaty day in Tokyo. We have chosen 3 different ice cream and gelato shops in Tokyo that are worth to try! Japanese Ice Ouca is an ice cream store located within few minute’s walk from Ebisu Station. The shop is not so big, and with its limited seats, Ouca is crowded all the time. 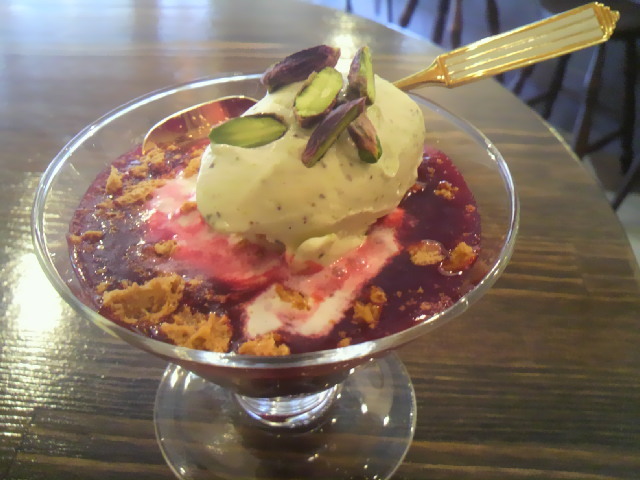 Ouca offers homemade Japanese ice cream, which is made with the finest local ingredients. The basic flavors offered at Ouca are: milk, matcha, ogura (red bean), black sesame, karinto, pumpkin, and kinako. You can also enjoy seasonal flavors such as strawberry, mango, kiwi, and orange. The texture of the ice cream offered at Ouca is similar to the texture of the gelato, very creamy and soft. There are four different cup sizes for the ice cream: komori (small), namimori (medium), oomori (large), tokumori (extra large). For komori and namimori, you can choose up to 3 different flavors, and for oomori and tokumori, you can choose up to 4 different flavors. In addition to the ice cream, you can also order soft drink and ice shake (similar to ice cream milk shake) as well. At JPY 680 for a medium cup, Ouca is not cheap compare to other ice cream shops, but still worth to try for its exceptional quality! Glaciel is a gelato shop produced by LeTao, a famous sweets shop in Otaru, Hokkaido. The shop is located within few minutes walk from Harajuku Station or Omotesando Station. The first floor of the shop is a boutique, where you can purchase gelato and other sweets products to take home, and the second floor is the eat in cafe. Glaciel offers not just delicious, but also cute gelato entremets! The gelato is offered in two different forms: gelato cakes and gelato sundae. Glaciel is very popular among the ladies in Tokyo, for its cute and tempting gelato products. Glaciel uses only the finest ingredients from Japan and all around Europe for its cakes, creating a perfect combination of rich creamy gelato and refreshing fruits gelato. You would feel the different textures of these gelato, which melt right away in your mouth smoothly. One of the cutest gelato is the mini Coccinelle, a gelato cake made of vanilla gelato and berries gelato that looks like a lady-bug. I ordered mini Coccinelle when I visited Glaciel last time, and the cake came with a small scoop of seasonal gelato. Mini Coccinelle costs around JPY 1,500 per piece, which is a little bit expensive for a piece of gelato, but worth so much for its cute appearance and delicious flavor! Gelateria Acquolina is one of the most famous gelato shops in Japan. The shop is located near Yutenji Station, and currently ranked third on Tabelog for the best ice cream shops in Japan (no.1 for gelato). Acquolina’s owner learned the art of gelato in Italy, so you can taste the real traditional Italian gelato at Acquolina. The shop offers many different flavors such as: fresh milk, chocolate, Earl Grey tea, tiramisu, pistachio, caramel, hazelnut, vanilla, passion fruits, kiwi, and mandarin orange. You can also find many unique flavors such as: olive oil, blueberry ricotta, cardamom, and zabaione. The shop also offers seasonal fruits gelato as well. The price of the gelato varies depending on the flavor, starting from JPY 620; create your own gelato cups with your favorite flavors! In Tokyo, you can find many ice cream and gelato shops, which you should definitely visit to beat the summer heat this year. Today we’ve listed up three shops for you to visit, but actually there are more gelato and ice cream shops in Tokyo to visit such as: Pierre Marcolini Gransta, Sincerita, Gelateria Theobroma, Ice Monster Omotesando, and Grom. We also have an article about frozen yogurt shops in Tokyo, a list of shaved ice shops in Japan, and best affordable Japanese ice creams that you should try!